Weight loss coaching with Claire Louise Hay - EMPOWERING YOUR DREAMS! In the picture on the left I was working out twice a day & my weight was staying the same & had done for many years. I had bought into the lies that weight is just harder to lose as you age (I'm 48), that weight gain is a part of menopause (I'm in it! ), that the closer you are to your lean body weight the harder the fat is to lose (I was never very overweight), that I wouldn't be able to eat the food that I love (I LOVE FOOD!) & that all you can do is restrict your calories, exercise even more & hope that your bodies hormones, metabolism, etc. will sort itself out (it doesn't). A simple wish for a flat stomach put me on a path of learning, of sifting through all of the information out there, trying it, finding out what works & what doesn't work, learning about how metabolism actually works, learning about how the body goes into laying down fat mode, what causes that & what causes the body to go into using that fat. Let me tell you, there is so much misinformation out there about weight loss. In fact the mainstream advice is some of the worst, it will keep you in fat gaining mode, never allowing your body to shift into fat burning mode & it will cause any weight lost to be regained right back & more. I was still exercising the same as I had been 6 months prior, but now those hard worked for abs could now be seen. This is great news because you can exercise the amount that you want to, too & this will work regardless! I am eating the foods that I love, not restricting calories. Isn't that what everyone wants? 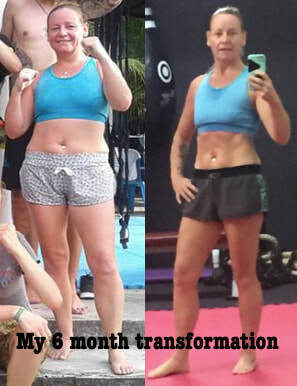 All that changed was my knowledge of my own body & how it works, so that I could apply what I know to ensure that my body goes into fat burning mode when I want to shed some fat. It is simple when you know how & why. It has given me a control over my body that I never experienced before. I used to restrict calories, workout & hope that the numbers on the scales went down, which they rarely did & if they did they would go back up again shortly afterwards. I'm excited to teach you! Now I can shed half a kilogram (1 pound) of fat in a day if I want to & even on those days can enjoy the foods that I love. The rest of the time I can easily maintain my weight & that fat doesn't go straight back on. You can do it too! Everyone can! Join us in my fast & easy weight loss mastery coaching program! Bonus: Get lifetime access for ongoing support in our exclusive Facebook group! You never need to worry again about your weight or the scary health implications. ​This is all you need for a lifetime of being in control of your weight & therefore your health!